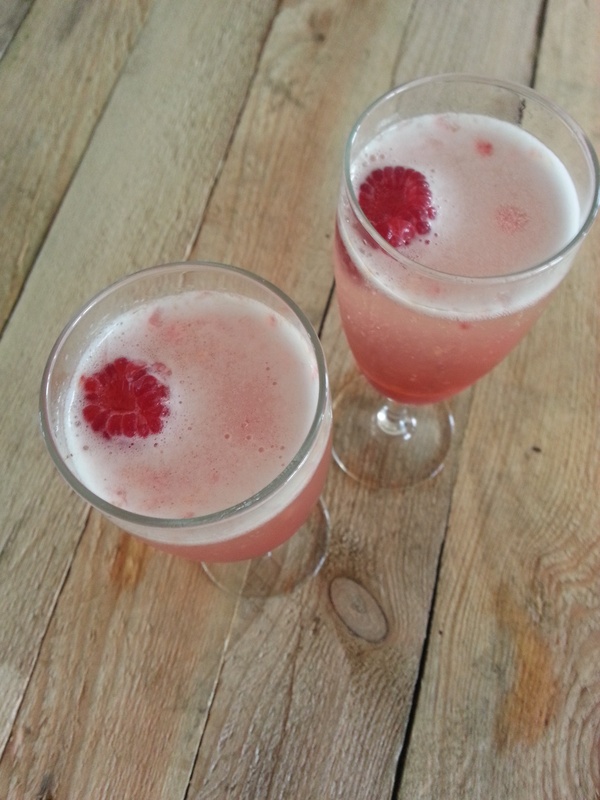 1 Blitz the raspberries, peaches and syrup, pass through a sieve, divide between 6 glasses and top up with Prosecco. Decorate each with a reserved raspberry. 1 For the English garden dip, blitz the peas, onion, mint and garlic, until nearly smooth. Stir through the yoghurt, lemon and chilli. Season to taste. Chill until needed. 2 Stir the garlic through the mayonnaise. Season to taste. Chill until needed. 3 Put the flour and water in a medium bowl and whisk to form a batter. 4 Fill a medium pan with oil so it is approx one quarter full. Heat the oil until a 1cm cube of bread sizzles. 5 Dip the mushrooms in the batter and gently lower into the hot oil and deep-fry until crisp and golden. Remove with a slotted spoon and lay on kitchen paper. Divide the mushrooms between 4 plates with a spoonful of each dip – don’t forget the ketchup! (See Bitalian Tip) Sprinkle sea salt over the mushrooms and serve. Get arty! 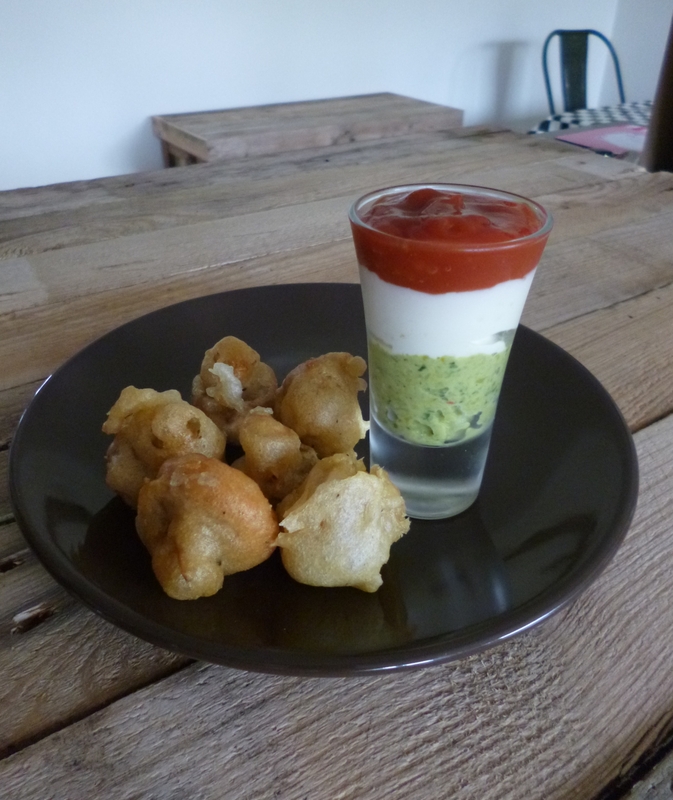 Layer the dips in shot glasses to resemble the Italian flag! You will probably have extra English garden dip, serve in small bowl for everyone to dive in! 1 Preheat the oven to 190ºC, 170ºC fan, gas 5. Place a layer of potatoes on the bottom of a 23cm pie dish, followed by a layer of onion, top with a layer of parsnips, then and scatter over some of the thyme. Repeat the layers until you have used up all the ingredients, reserving a little thyme and finishing with a layer of potatoes. 2 Mix the Harissa and tomato purée into the hot beef stock and pour over the potatoes. Scatter with the remaining thyme and the Parmesan. 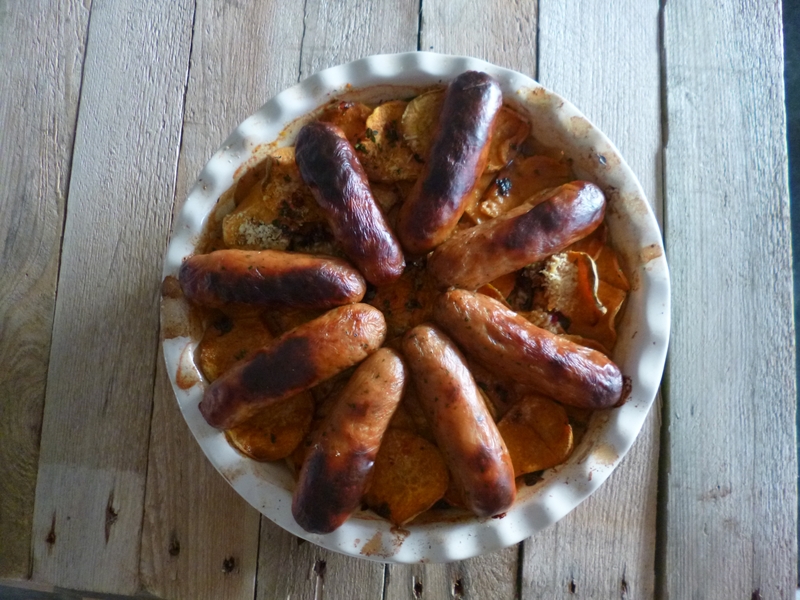 3 Bake for 30 mins, remove from the oven, place the sausages on top in a cartwheel fashion. Return to the oven and cook for 1 hour until the sausages are cooked through and the potatoes are soft. 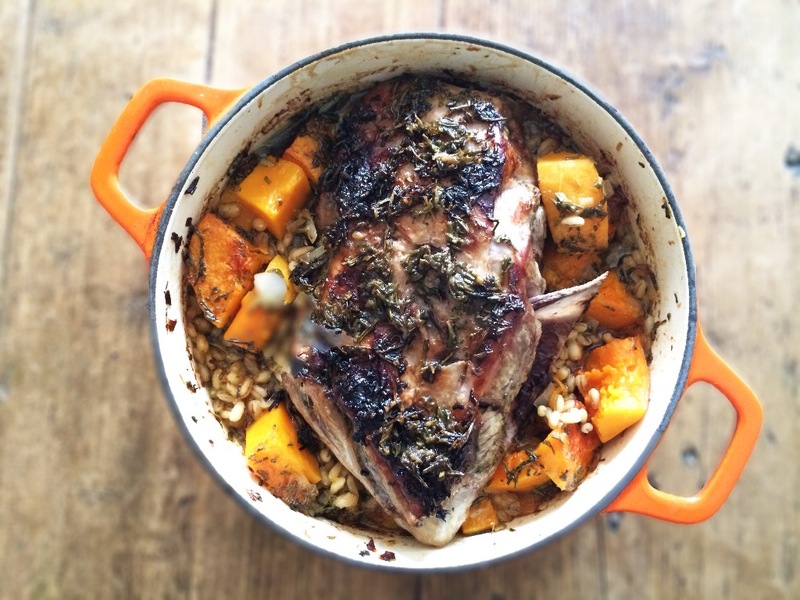 This is a recipe we developed for Sainsbury’s LWFL mag for a healthier Chinese feature (!). 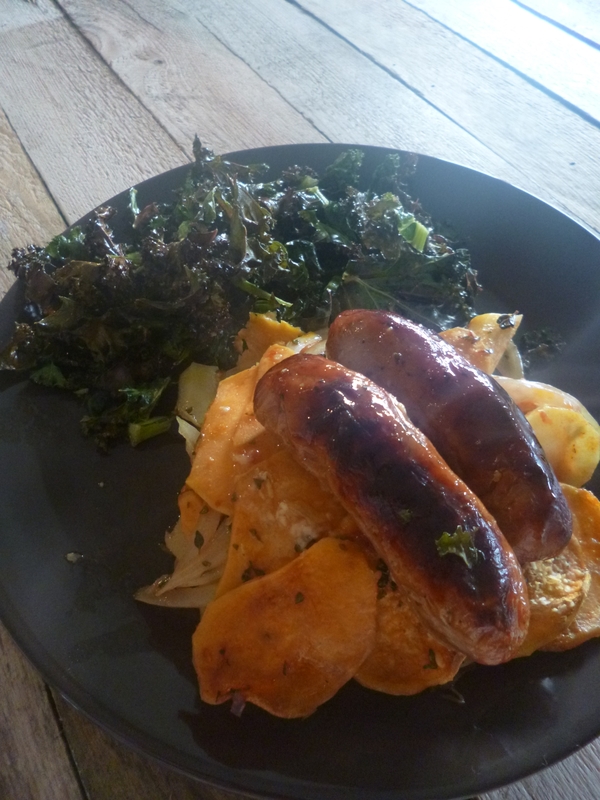 It may seem like an odd combo but the sweet crispy kale with the spicy sausages and the soft potato is a real winner. ‘My taste-buds are dancing!’ was a comment I got from my husband for this little number. My mum couldn’t believe I had gone to the effort of making Walnut Whip [her favourite] ‘tops’ to decorate it. When I explained they were just blobs of chocolate with a walnut shoved on the top, her beaming smile just got wider and she proudly said ‘you could sell them, they’re brilliant.’ Next year I’ll just make a pile of them and put my feet up. 1 Using a teaspoon, spoon the melted chocolate onto a parchment lined baking tray so you have 10 x 3cm wide disks, top each with a walnut half, then transfer to the fridge to set completely. 2 For the toffee sauce, melt the butter, sugars and syrup in a small heavy based pan and simmer for 3 minutes, stirring occasionally. 3 Remove from the heat, then add the cream, stir to combine, return to the heat and cook for another minute. Set aside to to cool. 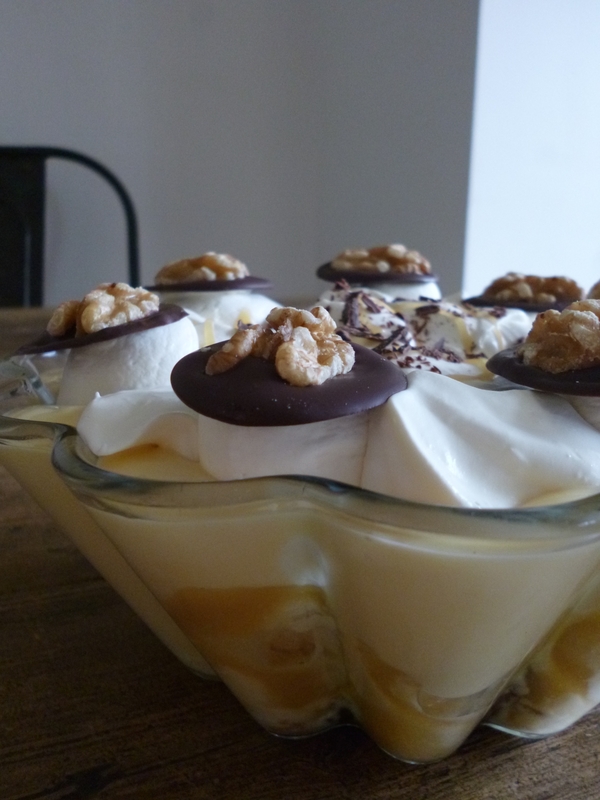 4 Meanwhile put the cake in the bottom of a trifle bowl, drizzle over the Martini, scatter over the bananas and drizzle over some of the toffee sauce (see Britalian tip). 5 Spoon over the custard. Leave to set in the fridge for 10 mins. Remove from the fridge and spoon over half the cream. Place the remaining cream in a piping bag or freezer bag. Cut a large-ish hole from the end (or one corner) and pipe 7 – 10 (depending on the width of your bowl) blobs around the edge, top each blob with a Walnut Whip ‘top’ (save any remaining disks to have with a coffee when everyone’s gone or if you’re feeling generous give them to your mum! ), drizzle a little extra toffee sauce in a spiral pattern in the centre of the trifle, scatter the chocolate shavings in the centre. Chill until ready to serve. This is the base of Nigella’s salted caramel recipe (without the salt!). It’s so easy and delicious and you’ll probably have some leftover, serve alongside the trifle or it will keep in the fridge for 3-4 days – delicious poured over ice cream! Or if you’re Nigella just pour it over your head (See Stylist cover Dec 2011). Love that shot.